Umpqua Indian Foods is the name of a meat snacks brand owned by the Cow Creek Band of Indians, based out of Roseburg, OR. The Cow Creek are best known in that area for their Seven Feathers casino, but also generate revenue through several companies, including Umpqua Indian Foods. 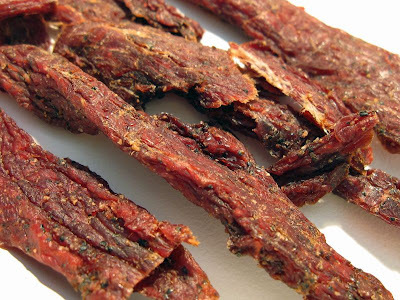 The company has been making beef jerky since 1998, selling it locally in nearby towns. Since then they expanded their processing capabilities, and unveiled a new logo, and are now trying to market their jerky as a gourmet product, getting into the Harry & David catalogs, and on such websites as Jerky.com. Umpqua claims that they use only pectoral meat, which comes from the cattle shoulder, explaining that this creates a more tender and moist jerky. That's in comparison to the round meat, which most jerky brands use. Beef, water, maple sugar cure (salt, cane & maple sugars, dextrose, sodium nitrite), black pepper, garlic. The flavor I pick up from the surface of these pieces is only a bit of saltiness. In the chewing, I get a heavier salt flavor, a faint bit of natural meat flavors, and a spicy tingle in the back of my mouth. My initial thoughts on the flavor is how bland this tastes. It's largely a salty flavor, and not really much else. 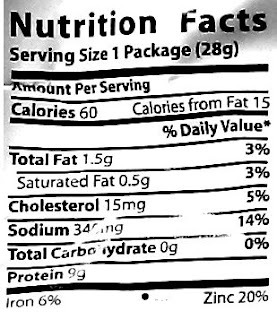 That level of sodium noted on the nutrition facts label shows that is only lightly salted, but it has higher taste intensity. It's the dominant flavor of this jerky overall. That's probably because this jerky doesn't any other taste to offer. It does have some natural meat flavors, but it's light. Considering there's little other flavor to compete against (aside from salt), you'd think the flavor would be more clearly identifiable. It is apparent, but it just doesn't come across as being a strong flavor. I'd call it the second-most dominant flavor of this jerky, but that's largely because doesn't have much other flavor to offer. And as for that third-most dominant flavor, there really isn't any other dominant flavor. Even though garlic is listed in the ingredients list, I can't say I sense any garlic, not even as an aftertaste. The black pepper has a faint taste, and one that I can only detect as an aftertaste over several pieces. Otherwise, I can't taste it on just one piece. That's probably what gives me that spicy tingle in the back of my mouth. For the most part, all I'm tasting is salt, and some light meat flavors. These appear to be strips of whole meat, cut into widths of about 1/4 to 1/2 inch, and lengths of about 3-4 inches. This is a dry jerky, perhaps even very dry. That's noteworthy because Umpqua Indian Foods claims that their use of pectoral meat is supposed to make this extra moist and tender. Rather, it's moderately brittle; just a little bit of bending causing it to crack and break apart. As for being tender, what I can say is that's it's easy to break apart, and easy to chew. The chewing texture is rather steak-like once it hydrates in my mouth. Because of how dry and brittle this jerky is, it crumbles apart into several small bits as I chew, but eventually reconstitutes into something like a well-done steak. It's very clean eating, leaving no residue on my fingers, and no fragments falling into my lap. It's also very lean. I found no amounts of fat or chewy connective tissue. I originally obtained this jerky from Jerky.com, but they've since removed it from their offerings. Otherwise, Umpqua Indian Foods sells this from their website at a price of $5.99 for a four ounce bag. That works out to a price of $1.50 per ounce, making this an average priced buy. For general jerky snacking purposes, at this price, it's a fair value. It provides some snackability, but not a lot. I find the taste to be rather bland and uninspiring. Of course, that's a subjective statement based on my preference. 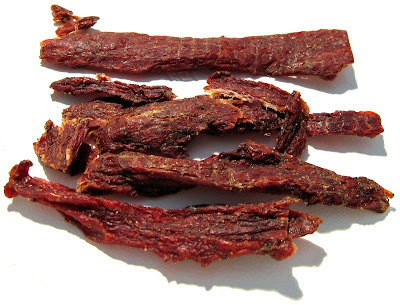 You might find this jerky to have a great taste. It does offer a great meat consistency, and good chewing texture. If you were to purchase this at a higher price, its snacking value decreases. But considering the $1.50 price per ounce is similar to a package of Oh Boy! Oberto original, and that it has a similar taste to Oberto original, you won't go wrong buying a package; you just won't get the gourmet jerky that Umpqua Indian Foods is pitching this as. While it has some snackability, it's just not a lot. The taste is rather bland, and uninspiring. I could definitely eat this stuff and be ok with it, it's just not something I'd consider to be a treat. The original varieties of jerky offered by most brands are usually basic in taste, but this is about as basic as jerky gets. Most original varieties still offer more taste interest than this, and so for that matter this jerky rates below average. At least it still scores some points with its great meat consistency and good chewing texture. My recommended beer variety for this jerky is an IPA.